One of the most peculiar announcements yesterday was that iOS 7 was now 64-bit. Apple seems to have left out that announcement at WWDC, possibly to avoid revealing that the A7 chip(and hence the next iPhone) would be 64-bit capable. Many seem to have assumed that this is just Apple preparing for the eventual transition. I think there’s more to it than that. Just a few days prior to WWDC this summer, the Xbox One was annnounced with 8GB memory. The 360 had 512 MB of memory. Earlier in January this year, the PS4 was announced with 8GB of memory. The PS3 had 256MB of system memory. If Apple were to release a competing living room solution now, as Steve Jobs claimed they had figured out, it would definitely have to have around 8GB of memory (if they were interested in addressing big screen console gaming seriously). It would also likely be iOS, and not OS X, that would be needed. I think that is why Apple just announced full-scale hardware and software 64-bit support, not because phones will eventually have 4GB of memory sometime in the future. The second bit of credence for this theory comes from the new Game Controller Framework that was announced for iOS 7 and OS X 10.9. This seems to address the user control issues with big-screen console gaming, while the 64-bit hypothesis above ensures compute and graphics capability for larger screens. Jony Ive’s mark can be seen all over the 5S and the 5C. Colors were an Ive trademark, all the way from the original iMac G3 to the iPods and now, to the iPhone. But the more subtle impact is within iOS 7.
iOS was originally designed for an era without a Retina display. It needed heavy skeuomorphism, relatively thick fonts and glossy UI elements, to distinguish itself elegantly in an era where pixels were large and visible. As the entire product lineup shifted to Retina displays, the design attained the potential of being refined to a more careful use of space. Ive and his team have done this for the internals of iOS devices for long. Now it was about the user interface. The internals have Mansfield written all over them. 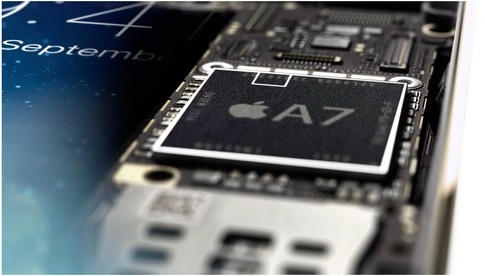 Apple pulled off a 64-bit transition in the A7 chip alongside a semiconductor technology upgrade beyond 32nm and developed the M7 coprocessor. I also suspect another S7/S8 for voice is in the works. Apple could have followed Samsung in licensing from ARM their big.LITTLE architecuture to achieve similar goals as the M7 coprocessor, but they clearly chose a different route. Mansfield had a role to play in such major shifts for Apple, not just another incremental A-series chip upgrade. Tim Cook and his executive team is out to prove that this Apple is the most forward-thinking yet.